I had lots of scraps left over from the bat and witch garland that I made last year, so I decided to use them to create this cute little Halloween Table Runner. I did purchase 1/3 yard of green that was used in between the framed hats. 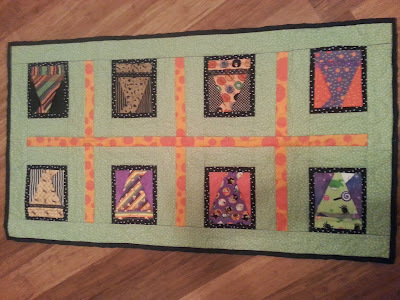 Ray did the quilting on this with her free motion foot....she did a great job! Very inexpensive and easy.